The Greek philosopher Aristotle, writing over two thousand years before Wall Street, called people who engaged in activities which did not contribute to society "parasites." In his latest work, renowned scholar Robert C. Solomon asserts that though capitalism may require capital, it does not require, much less should be defined by the parasites it inevitably attracts. Capitalism has succeeded not with brute strength or because it has made people rich, but because it has produced responsible citizens and--however unevenly--prosperous communities. It cannot tolerate a conception of business that focuses solely on income and vulgarity while ignoring traditional virtues of responsibility, community, and integrity. Many feel that there is too much lip-service and not enough understanding of the importance of cooperation and integrity in corporate life. This book rejects the myths and metaphors of war-like competition that cloud business thinking and develops an "Aristotelean" theory of business. 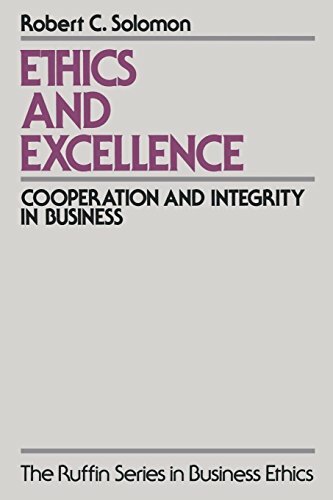 The author's approach emphasizes several core concepts: the corporation as community, the search for excellence, the importance of integrity and sound judgment, as well as a more cooperative and humane vision of business. Solomon stresses the virtues of honesty, trust, fairness, and compassion in the competitive business world, and confronts the problem of "moral mazes" and what he posits as its solution--moral courage.